Effective communication with your internal team is a cornerstone of successful projects. One of the more challenging problems relates to time-sensitive communication. Throughout the workday, the team frequently needs quick - not necessarily instantaneous, but quick - responses from other team members in order to keep moving forward. In this post I outline how I use Campfire for team chat, along with a couple of other Mac OS X apps (Propane and Growl). Note: We’re all on Macs here... so, get a Mac. 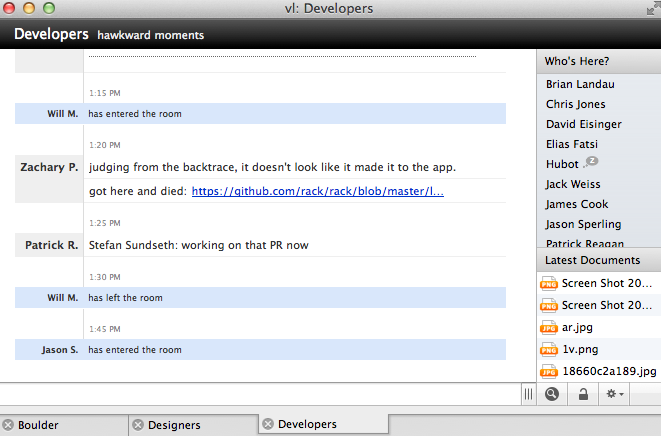 At Viget we use 37Signals’ Basecamp, Highrise, and Campfire for running projects and sales. Campfire provides a pretty awesome group chat. 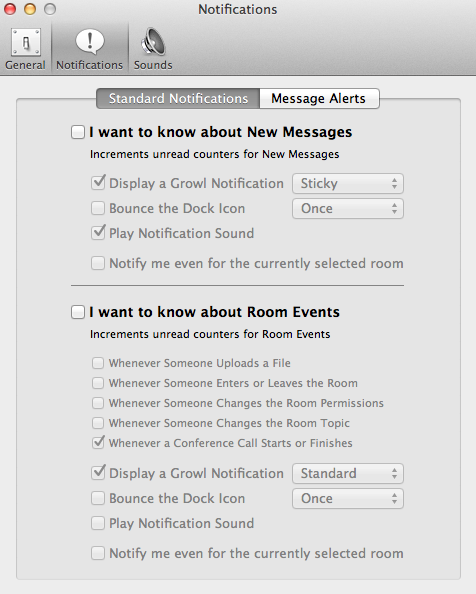 You create ‘rooms’ and people can join to share text, files, and code in real-time. It also maintains a transcript of the conversation, which is valuable. But... Campfire alone drives me crazy. It is web-based and as I tend to have a dozen or so browser tabs open, along with multiple browsers, it is difficult to keep track of something if I’m not actively working on it. But perhaps more troublesome is that you have to be in the room to monitor the action. You could have the sound on, in which case every single time every single message is posted you’ll get pinged. After a while, like three minutes, that Pavlov experience gets old. Propane is a desktop application that solves the browser problem, “a clean interface, smart drag-and-drop, custom notifications and more, Propane makes Campfire a joy to use on Mac OS 10.5.” I haven’t explored all the bells and whistles because it is so intuitive, but with a few clicks you can have it set up and humming along nicely with Campfire. After you connect to your Campfire site (URL of your Campfire account), find Lobby > Open Lobby Window. Select which room you’d like to be in. We’ve created three main types of rooms at Viget - by Office, by Discipline, and by Project. There’re dozens of rooms available, but here’s what the Propane application window looks like with three rooms open for the Boulder office, the Designers, and the Developers rooms. But to really make this an elegant and workable solution, there’s one last tweak - add Growl to the equation. What’s Growl, you ask? You can choose from a lot of different themes so you can select what works best for you. If you don’t already have Growl and want to try it, download here. Once installed, go back to your Preferences for Propane. On the Notifications tab, I turn off all Standard Notifications. 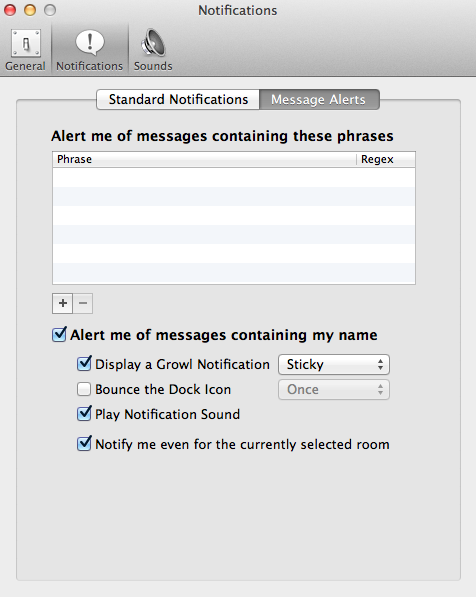 Then I update the Message Alerts so I only get a notification when someone uses my name. I have my settings adjusted so that the notification is sticky until I take action on it, and such that I don’t have to be looking at the Propane app to still get the notification (eg, “even if I’m in the room”). I dislike bouncing icons - again the Pavlov thing - and so have disabled that. With the whole project team using Campfire, Propane, and Growl (or some combination) and understanding how notifications work, people can post messages that are for the general team or ping someone specifically by including their name in the chat message. We find this incredibly effective for both asynchronous and synchronous communications. Special thanks to the Viget devs who helped point me in this direction! I just heard about Flint, which looks like a prettier alternative to Propane. I’m sticking with Propane for now but that looks nice and shiny.